"The board voted to raise the Academic Progress Rate benchmark from 900 to 930 and supported a penalty structure that will require teams to earn at least a 930 four-year, rolling APR in order to participate in postseason competition," the release said. There was no mention in the announcement of teams being allowed to fall below this minimum for a certain number of years, as they have been in the past. The idea for the new regulation came out of a conference between NCAA president Mark Emmert and 50 university presidents. After the conference ended last week, the Division I board of directors voted unanimously to approve the new rule. Last year, UConn's APR for basketball was 893. 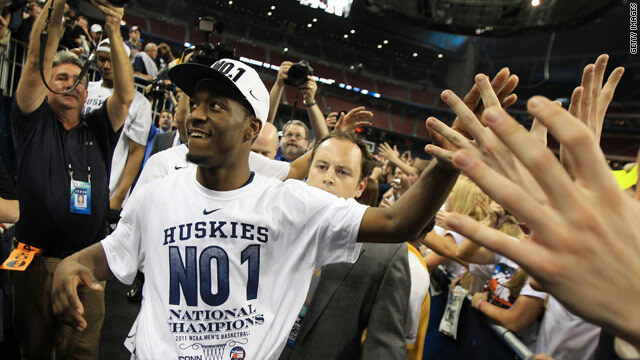 Since it was not their third consecutive year below 900, the Huskies were able to compete in the NCAA tournament. If the new rules had been in effect, they would have been barred from the Big Dance. In fact, several teams would have been. The University of Texas – San Antonio would have been out, as would its play-in opponent Alabama State. No. 3 seed Syracuse may have lost to No. 11 Marquette because of a questionable call, but if the new academic benchmark had been in place, the Orange wouldn't have played at all. Florida State University, with an APR of 926, would have already fallen short before it could fall short of beating Virginia Commonwealth University in the Sweet 16. The rule, had it been in effect, would have also changed the look of the football postseason. All of last year's conference champions were in the clear APR-wise, but other competitors in post-season bowl games would not have been. Though Michigan came nowhere close to beating Mississippi State in the Gator Bowl, it would have just missed the APR cutoff, with a score of 928. Maryland beat East Carolina in the Military Bowl, but the Terps' APR of 922 would have kept them from playing at all. The New Mexico Bowl and the Beef 'O' Brady's Bowl would have had completely different makeups, as Brigham Young, University of Texas – El Paso, University of Louisville and Southern Mississippi all had APRs below 930. The NCAA news release said a detailed timeline for implementing the new academic benchmarks will be ready in October. How sad is it where a 50% graduation rate is good? No wonder we're graduating a bunch of a dumba$$e$. I use to believe that NCAA Sports were more entertaining t0 watch than professional sports because the athletes were not corrupted by money and gifts. Well, that belief is gone. Now we have an academic standard that takes three more years to enforce. With everything that has happened at Ohio State and the University of Miami, I wish the NCAA would create a "death penalty" whereby all athletics are closed down for four years, giving the university time to clean-up the mess. It would be disappointing if the grad rate was 50%. Apparently that's a struggle. Which is why in Canada (at least in Ontario that I know of) we dont allow sports scholarships. What kind of degrees are these kids getting anyway? PE, Home Economics, Philosophy? Could someone tell me? Chad- What is your verifiable degree? What are your children majors? Some of them get a degree in "African Studies"
Does your daughter receive access to tutoring and extra help that those other non-athlete students do not? In my engineering program we had two D1 football players. One of them legitimately deserved to be there, declined extracurricular tutoring, and had an (understandably) lower GPA due to the high demands of being an athlete. The other was as dumb as a box of rocks and had a tutor hold his hand through all four years- he wound up with a very high 3.85 yet could not answer any questions from the professors if asked and was technically incompetent. Not saying your daughter falls into either of these categories, but if she had access to a tutor she cannot be compared on the same tier as students that do not. No big deal, the big colleges will just cheat more on student academic testing just like they do with other rules. The NCAA has no control anymore and I am convinced they are just in it for money too. Its all about churning out athletes for the next level, and a winning college team brings big paychecks to their college. Colleges will find a work around for this instead of focusing on academics as the NCAA intends, because they want to get rich fast. I think this is a good idea but there is too much emphasis on graduation rate. I think it should focus more on GPA or ongoing classroom performance. The reality is many college students (athletes and non-athletes) never graduate for a variety of reasons. I don't think the teams/coaches should be held to a graduation rate to determine if they can participate in post season activities. If the student athlete is making good grades but then doesn't graduate (leave for personal reasons, transfers, turns professional, etc) why should the team be penalized?